Nicole Carroll, Director of Certification and Training, explains the evolution of CrossFit’s trainer credentials. CrossFit’s growth has been organic and infectious: There were no marketing strategies and no projections for the now more than 10,000 affiliates and 90,000 trainers. It started with one trainer, then one more and then a few more. The only “strategy” was to have fun, get into ridiculous shape and help anyone else do the same. Our numbers grew rapidly, and suddenly there were a lot of us. The Level 1 Trainer Courses were, and still are, the primary gateway to the CrossFit community. The Level 1s are the place to learn more about the timeless underpinnings of the CrossFit methodology, and they are the essential experience to becoming a CrossFit trainer and CrossFit affiliate. Successful completion of the Level 1 grants attendees a basic understanding of the fundamentals necessary to train others responsibly. CrossFit Founder Greg Glassman would always close the Level 1 with an appeal to take what you have learned and go out and help others: “Grab a broomstick and go train your neighbor.” This is the spirit that has enabled the fitness revolution called CrossFit. Early on, we recognized the demand from the community for more—particularly from trainers wanting to apply the principle of virtuosity to their craft. An educated trainer possesses a solid knowledge of movement mechanics, programming, nutrition and the surrounding disciplines relevant to physical well-being and performance. A more advanced trainer applies this knowledge to program design, discerns sound from unsound movement mechanics, and displays the ability to correct the unsound to maximize safety, efficiency and efficacy. A great trainer, or coach, builds upon this skill set and approaches each client with a genuine desire to get the best results. A coach, in the relentless pursuit of excellence, tailors an approach to meet individual goals, needs and motivations. A coach inspires clients to be better than they would be by themselves. With this in mind, we are proud to announce a new structure to our continuum of education and qualifications: the Level 2, Level 3 and Level 4. To understand the value of and rationale for the new programs, a review of their evolution is useful. Awesome job guys! I can tell you put a lot of thought and work into developing this system. I'm sure it's all going to pay off. This is absolutely awesome! Fired up to see a higher standard and education commitment! Great job! I like where CF is going with this. Higher Standards, developing coaches, this is all good for the progression of CF. 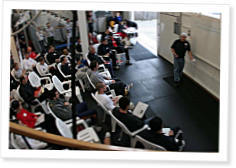 I apologize, if I missed this somewhere in the FAQs - if we have already attended the Coach's Prep Course, do we still need to attend the new CF-L2 course? i read the FAQ and i haven't seen anything about what constitutes a continuing education unit for maintaing the level 3 designation. Any help would greatly appreciated!! No, you are granted a L2 that stays current as long as your L1 is current. Thanks EC, time to work toward my Level 3 then! Very nice work, Nicole and team. This is fantastic for our team. We look forward to participating and growing as Coaches. I loved the last page and your take on Certification. You haven't lost sight of whats really important. Nice job! It's good developing a higher standard. A great thing to grow as a coach!! It's always evolving! Love it! Unfortunately I never saw a Prep Course here in Brazil yet. I'm looking forward to see this here. How can I prove the amount of Crossfit Classes that I gave? Can someone tell me? I'm from Brazil. I own a CF-L1 certificate, I'm teaching people. But there isn't any record which I can prove these hours. I'm just waiting a CF-L2 course in South America to apply. We have requests from many international locations and are doing our best to meet the ever growing need, while keeping the quality high. I am sure we will get to Brazil, but I cannot specify when.